Plainview Baptist Church is located at 1820 Ms. Hope Church Road, east of Greensboro in McCleansville, south of I-40/I-85 near Replacements, LTD. Unfortunately, the church doesn't appear to have a website so we can't tell you much more than what we saw on location. Plainview is very typical of our Southern Baptist churches: simple white, wooden building; large trees on the lot; cemetery out back, and gravel parking lot on the side. Plainview has both a Sunday morning and evening service as well as a Wednesday service. Before I-40 was constructed, Plainview was a rural church on a curvy road serving the farming community and upon approaching the church it must have seemed like it was in "plain view." Today, it is located next to a gas station, convenience store, car wash complex as well as large offices. However, from the view above, Plainview likely looks very similar to when it was built. We bet it has a great history, just waiting to be written. See more of our Sacred Sunday posts here. Laurencio Carlos Ruiz, visiting artist/puppeteer at Elsewhere Artists Collaborative, unleashed these paper balloons on the lawn at Center City Park in front of the Davie Street Cultural Arts Center. If you look above the rightmost balloon, you can see the roof of the Cultural Arts Center peeking out. Part of July's First Friday activities, the balloons were located on the very spot where many of the Fun Fourth festivities will take place over the next three days. One person commented that they looked like something out of a Roald Dahl novel. A Kindergarten teacher said they reminded her of colored pencils. At any rate, children and adults alike enjoyed running between the balloons, peeking inside them, letting their imaginations run wild around them, and having their photo taken with the festive display. Let this be another example of why one should never sit home alone on First Friday with so much happening in downtown Greensboro. Same goes for Fun Fourth, this community celebration that has been taking place in Greensboro since 1975, is another opportunity to get out and enjoy downtown. The event schedule can be found at the previous link here. It is the first of July which means that City Daily Photo blogs worldwide are celebrating the theme "green." Well, how could GREENsboro resist participating in the "green" theme? For our contribution, we've selected the window of Action Greensboro, a non-profit organization established in 2001 to enhance Greensboro's economy and to break new ground in addressing community needs (reference). Action Greensboro endeavors to address the following six community needs: 1) Attraction and retention of young professionals; 2) development of the center city; 3) recruitment and retention of business and industry; 4) enhancing Greensboro's image; 5) enhancing small business development and entrepreneurism; and 6) supporting the public schools. Action Greensboro is located in an historic building at 317 South Elm Street. Their funding is provided by: the CEMALA Foundation; Community Foundation of Greater Greensboro; Cone Health Foundation; Ellison Family Foundation; Bryan Foundation; Tannenbaum-Sternberger Foundation; and the Weaver Foundation. This list is evidence of how much Greensboro's local families give back to the community. The Center City effort has been especially visible.If you want something to do, head down to Elm Street or Center City Park and celebrate First Friday this evening. You will think you are on a vacation without leaving town. Finally, if you want to see more green, visit Greensboro's famous GREEN drink featured on GDP last Saturday or head on over to City Daily Photo to see green from Paris to Mumbai! Here we see a little house at 220 South Eugene Street with the BIG HOUSE in its back yard. Six months ago, we featured the jail under construction (here) and the Zenke family properties that had to be moved to make room for the new facility (here). The little yellow house is actually part of the administrative complex of the Guilford County New Detention Center-- the official name for the BIG HOUSE. The yellowish building with the rounded dormers is the Office of the Sheriff. Between it and the little house is the Personnel and Training Office. If you are local you might enjoy walking around the block to view the new facility and all of the ancillary buildings. If you have children, it would be a great opportunity to explain the judicial process and the difference between a jail and a prison. If you want you can walk across the street to the court house and sit in on a court case. For Greensboro, getting a new $85+ million dollar, new 1,032-bed detention center is bittersweet. On the one hand we need the space; on the other, it is unfortunate that we have so many crimes committed. As the News & Record points out, current budget cuts will impact this new facility. Sheriff Barnes gives a compelling argument for needing adequate staffing. Today is ABC Wednesday and, as you may know, for this series, we've been featuring streets. Well, what to do? There is not even one street in Greensboro that begins with the letter "X." Many of you were kind enough to suggest that we feature a major crossroad of two Greensboro streets. That was our intent, when, serendipitously, we stumbled upon this street-related X at the Greensboro Historical Museum. In the above photo, you see a stone marker with an X carved in it. The brass plaque below the X reads, "Last stagecoach marker in Guilford County. Formerly located at Sedalia, the "X" indicated that Greensboro was 10 miles away. Such markers were common on the main roads prior to 1860." So, for ABC Wednesday, X, Roman numeral 10, marks the spot. This stagecoach marker and X in the road was located very near this diner in the eastern end of the county, 80 miles west of yesterday's post. View our previous, ABC Wednesday ( A-W) posts here. 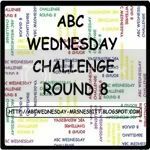 Two more weeks until we think of a new theme for Round 9 of ABC Wednesday. While the North Carolina Museum of Art (NCMA) is located in Raleigh (not in Greensboro), it is a public, state museum which means that, from Manteo to Murphy, ALL North Carolinians have a vested interested in it. In 1947, when the state first earmarked funds for an art collection, it was the first state in the U.S.A. to do so. NCMA's history dates back to 1924; however, the first permanent venue opened in 1956 in downtown Raleigh and the current Blue Ridge Road location opened in 1983. In 2010, a second building opened on the 164-acre Blue Ridge Road property. If you want something fun, educational, and recreational to do this summer, grab your family, friends, walking shoes and bicycle and head to NCMA. Unless you dine in the wonderful restaurant or go to one of the exhibitions on loan, the museum is FREE. Read more about all that NCMA has to offer HERE. The visual art in the photo above, by Devorah Sperber, is called Mona Lisa 2. It is made from 5,184 spools of thread-- fitting for a textile state. If you look through the crystal viewing ball in front of the piece of art, not only is it right side up, you can also move the sphere around to see if Mona Lisa's smile follows you. See more of Sperber's thread spool works HERE. They range from a few hundred to 60,000 spools of thread. We are so lucky to have not only one of Sperber's installations but also this wonderful museum with exhibits ranging from Ancient Egypt to the digital age. We decided to feature Raleigh today, ninety miles to the east, because tomorrow's post will be ten miles east of Greensboro, where, years ago, stage coaches stopped en route to town. Stop back by to view this little piece of history. High above Elm Street is a whole world teeming with activity. Here we see a rooftop area for rest and relaxation. When weather permits, people with rooftop access are up here enjoying the sun. The triangular tarp to the left keeps the sun at bay on extra warm days. Many of the buildings downtown have fabulous outdoor spaces either terraces above or alleys behind. The building in the photo is in the 200 block of Elm Street, near Triad Stage and across the street from Shiffman's Jewery Store. Probably the most famous terrace in downtown Greensboro is the one at the nearby Kress building. If you are looking for something to do this summer, find a new vantage point from which you can enjoy your city. We were at the Greene Street parking garage when shooting this photo (as well as this one). Here's to a great week. Happy "fresh start" Monday! If you want to learn about Judaism in general, Judaism in Greensboro & North Carolina, and contributions to the local community by Jewish residents, visit the Greensboro Historical Museum and view this free exhibit. It starts with the above display of items important to a religious service, along with an 8 minute overview of the names and significance of the parts of a sabbath service. You can also see how a kosher kitchen is maintained. You can watch a video of a family seated to begin the sabbath meal and hear of its significance in linking the family members to each other as well as helping them connect to the the Jewish community at large. The Greensboro Historical Museum is open on Sundays from 2-5 in case you are looking for something to do today. Go see a yad, tefillin, tallit, Havdalah spice box and more! Although for Jews, Sunday is not the sabbath, it is the day on GDP when we share something spiritual and significant to the Greensboro community. In 2 1/2 years of Sundays, we are nowhere near short of running out of things to feature. See previous posts here. Those of you old enough to remember the Boar & Castle Drive-In Restaurant on West Market Street (at Walker Avenue) will know all about butter steak sandwiches, green drink and Boar & Castle sauce. In the above photo, these items have just been served up at Fincastle's DIner (215 South Elm Street) in downtown Greensboro. Fincastle's owners, nostalgic for a taste of the old Boar & Castle as well as filled with great ideas of their own, have been preparing meals like the one above since opening downtown in 2005. The sandwich was great and just the way it would have been served in the 1960's: lots of special sauce, loaded with melted butter, a bun that was soft on the outside and crispy on the inside and, last but not least, a generous chunk of steak. The drink, with strong undertones of pineapple, likely would have been smaller in portion but equally sweet and GREEN! We wanted to feature this iconic Greensboro meal today because both The Fresh Market stores in Greensboro are having a food event today where you can purchase Boar & Castle sauce. This Greensboro-invented sauce is the tangy condiment that gives butter steak sandwiches their unique flavor. Had we been true to history, we would have ordered fries or onion rings to dip in the sauce! If you want to learn more about Boar & Castle sauce, read this Jeri Rowe article. Between his article and all of the follow-up comments, you'll begin to understand why Grimsley and Curry High students flocked to the Boar & Castle Drive-In Restaurant for lunch and would return at night to hang out with friends. "Greensboro, North Carolina's Southside neighborhood, a 10-acre revitalization project, is one of the city's first significant mixed-use infill projects.Greensboro's Department of Housing and Community Development developed a traditional neighborhood district ordinance-- based on the Southside Area Development Plan adopted by the Greensboro city council in 1995-- to assist Southside's redevelopment" (Buntin & Low). Southside has been wildly successful and, Buntin and Low report that before re-development, this 10-acre area took in less than 1/2 million in tax revenue and post-development takes in around 10 million in tax revenue. If you are looking for something to do with so many extra hours of daylight, we suggest heading over to Southside, perhaps even to the Vintage301 Restaurant, to see what's cookin'. We're proud to share these clouds drifting through the radiant sky with our friends at Skywatch Friday. The Greensboro Aquatic Center, part of the Coliseum Complex, is located on High Point Road beside the ACC Hall of Champions. If you look closely (or enlarge the photo) near the purple, you can see workers in the process of finishing the exterior. Like the new baseball stadium, the history of the aquatic center is not without controversy. Confusion the way it was presented to the public in the bond referendum and concern that it was a non-essential in these financially difficult times were the two main issues. Fortunately, bookings are starting to pour in. The 2011 Masters Swimming High Performance Camp will be held here at the end of August. This camp will attract competitive adult swimmers and coaches from all over the USA. Next spring's Masters Championship will be held here, April 2012. Also in April, the venue will host the 2012 YMCA National Short Course Championship which historically attracts 1,600 swimmers and 4,000 spectators. If you have ever been involved in an away sporting event, you know that one can easily spend $500 dollars between several days in hotels, food, sports-related paraphanelia, gas, etc. Those involved in competitive swimming in Greensboro know that it is difficult to find pool time for practice and meets. Many of the facilities with Olympic-sized pools lack adequate space for spectators. This venue will change the face of swimming in Greensboro. Let us hope that at the end of the day, as was the case with Newbridge Bank Baseball Park, the Greensboro Aquatic Center will be "a good thing" for Greensboro. For sure, the face of High Point Road is changing as we type. Just the sight of that wavy roof makes us want to grab our goggles and suit up! Today is ABC Wednesday and, by popular demand, "W" is for Westridge Road. Westridge is an east-west road between Battleground and Friendly Avenues. To the east you have Village Tavern and to the west, Friendly Avenue Baptist Church and the Greek Orthodox Church. At the time it was constructed, Westridge really was at the western ridge of Greensboro. It crosses over Bryan Boulevard and Hobbs and the area between Westridge, Hobbs and Bryan Boulevard is known as Westridge Heights. The house in the above photo actually has its address on Smoketree Drive; however, this photo was taken on the Westridge side at the Bryan Boulevard West entrance ramp. When the home was built in 1996, many residents were in disbelief that someone would build so close to Bryan Boulevard. It was if the house were being built on top of this major access road through Greensboro. However, the owners did such a fabulous job of planting trees, shrubs, and perennials that today, fifteen years later, the mature plantings really do shield the property. If you drive from one end of Westridge to the other, you will notice that it is actually very difficult to photograph the homes. They are not only set back from the highway, they are often elaborately landscaped and somewhat hidden from view. Even for this Victorian-style beauty with the stunning wrap-around porch, we had to duck under trees, as evidenced by the shadow line in the foreground. Well, next week, we're going to have to do something creative because no street in Greensboro starts with an "X." Suggestions? Also, if you're just joining us and you want to catch Greensboro's A-V streets, go here. Finally, click the button below if you want to see what the rest of the world dreamed up for "W" day. I wish I could have a puppy. I wish moving back to my house and see my friend. I wish I could have a monster truck. I wish for a teddy bear and a star pillow. I wish my daddy would quit smoking (signed Emma B). There are many more wishes in this tree-- from a horse finding a home to always having enough money. Some of the wishes reveal utter childhood abandon; others reveal children who carry in their hearts the worries, fears, and dreams of their parents. At any rate, all of these creative programs for children and adults as well as plenty of DVD and book choices to borrow for FREE are yours at Greensboro's local public libraries. Even if you don't want to check anything out, you owe it to yourself to stop by a library to see your tax dollars being put to good use. Besides, you could slip a wish or two on the tree............. For a mere $10, you can become a friend of the Greensboro Public Library and support this public goodness. If you follow that link, you can join online! Our wish today is that these wishes will come true. Greensboro couldn't have asked for a more perfect way to kick off the summer (and to celebrate Father's Day) than the Summer Solstice Festival 2011, held yesterday at the Greensboro Arboretum. Fun was had by all at this intergenerational event. From toddlers to great-grandmothers, people donned brightly colored clothing, fairy wings, tulle, and glitter and hula-hooped the hours away. We don't have the attendance figures, but we're guessing that this year's event was the largest yet. The weather was perfect and adults, children, and pets were on their best behavior. Hats off to Greensboro for another safe, FREE event in a public space. We're gearing up for Greensboro's next big event, Fun Fourth, which will be held downtown and will culminate with the Fourth of July fireworks display at the Coliseum. Time to hang up the tie-dye and to bring out the red, white, and blue attire. As seen in the photo above, dressing for the events adds so much to the ambiance. Today is Sunday, time to reflect on the week, on our spirituality, on the summer before us. For our Sunday selection, we're sharing Fellowship Presbybterian on New Garden Road just behind Brassfield Cinema. This church boasts a friendly and open atmosphere. According to their website, the congregation first decided that Northwest Greensboro needed a Presbyterian church in the late 1950's and first held worship services in 1964 at Claxton Elementary School. They have been in the current building since 1984. Service to others is a key component of to the members of Fellowship Presbyterian. Recently, the building facility has expanded, as has the neighborhood. New Garden Road, itself, has gone from being a twisty, country road to a multi-lane highway. While they still appear to be in search of a pastor, Fellowship Presbyterian is a dynamic facility with people of all ages using it from Monday to Sunday. We want to get inside to see if the church has windows. Dear Wendy's: Here's the Beef! Are you old enough to remember Wendy's 1984 advertising slogan, "Where's the beef?" with actress Clara Peller staring at a big, fluffy bun with a miniscule hamburger? Over the last 27 years, Wendy's has built their empire of selling "good old-fashioned hamburgers," square and substantial, and offering customers a choice of condiments on their burgers. Yesterday, we were in disbelief that now the default "single" is the cheeseburger. If we understood the woman at the drive-through window, the customer pays cheeseburger price and at your request, they will omit the cheese; however, the cheeseless burger costs the same as one with two slices of cheese. To quote the person who waited on us. "It is just like when we leave the pickle off." This situation upsets us for two reasons. First, obesity is epidemic in North Carolina (in much of the USA). Also, a single with cheese on the top and the bottom adds approximately 140 extra calories. That is a lot of calories, especially if people eat the sandwich without even thinking about it and they don't even really like cheese. Secondly, cheese is not free. The sandwich price has cheese costed in. So, the consumer of a single hamburger is making mandatory donation to Wendy's every time they opt out of cheese. For each million served, that is a lot of PROFIT. What if Wendy's gives the that money to the U.S. government to help underwrite health care costs associated with obesity. What would Dave Thomas (the founder of Wendy's) have to say about this situation? Finally, sorry if you saw this post previously. It accidentally published ahead of schedule. Today's post takes us to Camberly's Garden at the Tanger Bicentennial Garden off Hobbs and Holden Roads. The above photo is fairly indicative of what you will see in Camberly's Garden-- foilage, sculptures, and flowers; beauty all around. If you spend time in this tranquil place, you start to feel the energy and emotion of this memorial garden dedicated to Camberly Holliday, daughter of former Mayor Keith Holliday and his wife Cindy. Camberly died unexpectedly in 2002 of a brain aneurysm. Camberly was one of those young women who had a full, well-rounded life: music, dancing, Girl Scouts, academics; she loved and brought joy to her family, friends, church, and community every day of her fourteen short years on earth. We are so grateful that Greensboro has this garden where we can go to reflect, hope, and dream. With each wilting flower or new bud, Camberly's Garden reminds us that life is precious, yet fleeting. This is our post for Skywatch Friday. This Sunday is not only Fathers Day, it is also Summer Solstice Day at the Greensboro Arboretum (at Market Street near Lindley Park). While the Summer Solstice in the Northern Hemisphere officially begins on June 21st at 1:16 pm EDT, all of Greensboro comes out to celebrate on Sunday the 19th when families and venders are more able to get away from their weekday work commitments. We're slipping in this photo from last year just to generate a little excitement and to start planning our attire. It will be hard to beat last year's "best of show." Don your floral headband, brightest tie dye, fairy wings, glitter, face paint, diaphanous skirts with leggings and spend the afternoon among performers and vendors. There will be people strolling in costume as well as children with their faces painted and pets all gussied up. You will have more fun if you dress for the event. There will be performers of all genres and the grande finale will be a fire show at 9:00 pm. Our community puts a lot of time and effort into this event. Please come out and support our community on the longest day of the year. What is unique about this photo? Well....we see four right hands (including the one in the tapestry) and no left hands. Vanstory intersects Holden Road by Smith High School; it winds behind the Four Seasons Mall and Koury Convention Center and ends at High Point Road with a cemetery on the right and Hanes Lineberry Funeral Home on the left. In between, you will find businesses, apartments, churches, and private residences. We're not sure how the street got its name but Vanstory is a Greensboro name with much history. The Vanstory Clothing Company opened in downtown Greensboro in 1900. It was located in the Vernon Building (built in 1883) at the corner of Washington and Elm Streets. The LIberty Oak Restaurant is located in that building today. We're hoping one of our readers will know the connection between Vanstory Street and the Vanstory Clothing Company. Surely there is one! See our earlier ABC streets here! Can you believe we're almost at the end of the alphabet?! Do you plant tomatoes? What are your secrets? This year, we planted some tomatoes traditionally, in the ground around our patio; additionally, we planted two in topsy turvy containers (see above). Some people have great luck with these downward growing plants. However, for us the ones in the ground are thriving and the ones in the topsy turvy container seem to be in a downward spiral. You are supposed to water them daily and we suspect that precision watering is key. At about $15 a green pouch, plus the cost of the plant, we could buy a whole lot of tomatoes at our local farmers' markets for the price of this gardening mis-adventure. We'll keep you posted on our little experiment in Greensboro, NC. How about letting us know what you are looking forward to from your garden. We try to plant only edibles and blueberries will be ready soon! When Garson Rice, Sr. opened Rice Toyota in Greensboro in 1965, it was one of the first Toyota dealerships in the USA; the first in the South. At the time, 2630 Battleground Avenue seemed more remotely located as Battleground was not as commercial and built up in the 1960's. Today, the Rice Toyota Dealership has grown and extends on both sides of the street. It is not unusual to see salesmen and managers traversing the multiple-lane highway to get to the offices (or McDonald's) on the other side. Knock on wood, those smiling guys in polo shirts and slacks seem to have mastered crossing the street safely. In the photo above, a Rice Toyota customer and Prius owner, is sporting a badge of pride-- a vanity plate. As the Greensboro owner informs us, this Prius gets 49 miles per gallon of gas. The owner has reduced her carbon footprint and is providing a subtle reminder that we all need to be getting 40, 50, or more, miles to the gallon of gas. We first test drove a Prius at Rice Toyota. Perhaps it is time to see what we can negotiate with Mr. Rice, Junior, who works tirelessly to continue the legacy built by his dad. In three years, the age of the dealership will equal the MPG. This house on Randleman Road (just south of downtown Greensboro) has several religious statues on the property. The statue of Jesus, clothed in purple and white, is positioned near the front porch. These three children were exploring the porch and yard. Somehow summer adventures, like exploring the neighbor's house, seem more fun when you are with a group. Do you remember those lazy days of summer when you had adventures with siblings, cousins, and friends? This is our Sacred Sunday shot. Each Sunday, we show something of a spiritual nature (see here). This one evokes the song "Jesus Loves the Little Children." Spraying water screams summer fun more than about anything else; whether you are at a water park or just a park with a water element. Above, we feature the water mister at The Tanger Family Bicentennial Garden last weekend. Children gleefully ran through the water-- usually more than once-- on the extremely hot day. Today is the first day of summer vacation for public school children. Many students have headed to the beach with their families, a North Carolina tradition. (We have great beaches). However, for those of us who can't get away, a water park or garden hose will be just fine. We love the way the triangular shape of the young boy's folded balloon mimics that of the above structure's frame. Finally, that little reflection on the ground qualifies us to participate in James' Weekend Reflections! Today, June 10th, is the 180th day of school which means that school is over for the summer in Guilford County (NC). Hopefully, teachers have inspired students to love learning; students have put their best foot forward and made every effort to excel; and parents have been there to support their children and their children's teachers every step of the way. Let us hope that this year was great for all and that next year will be even better. One sure thing about teaching and learning is that the summer gives us all time to renew dreams and to refuel for a fresh start. May your summer be everything you are dreaming it will be-- and more. Don't forget to read! This photo was taken as busses exited Lincoln Street onto Lee Street on the campus of Dudley High School and the Academy at Lincoln. This is a busy intersection with many students walking to school. Crossing guards work diligently keeping students safe (even those who think they're too old to be helped across the street). Here is a virtual wave goodbye and a warm embrace for our Skywatch Friday friends who will be looking at that slice of sky in the background. Just down the road from the Palmer Institute and the Charlotte Hawkins Brown Museum, on Wendover East heading towards Burlington, development butts heads with rural living. On this property is a home, The family on this property lives behind the long-ago diner in Sedalia that we featured here. With the Dollar Store peeking in the background, likely, it will not be long before retail and new-construction engulf this property. However, for now, it fits the definition of arrested development. Development has been stopped. The spot of greenery looks so cool and cozy, as if you could sit all day and reminisce on the good old ways. Pull up a chair and rest a spell. We can assure you that if this photo had sound, you would hear barking dogs; you would hear the owners opening screen doors to see who was on their property. You would hear crickets and frogs and see lightening bugs; all-the-while, the buzz of lights from the lot at the Dollar General next door is a perpetual reminder that retail is a stone's throw away. Today is ABC Wednesday and U is for Underwood Drive. Underwood is located in the Friendswood neighborhood of Greensboro. Friendswood is sandwiched between Meadowood and Guilford College Road, not too far from Hamilton Lakes and about a mile from Wendover. The streets here are definitely the "woods." (Underwood, Virgilwood, Buddingwood, Friendswood, Big Tree Way, with nearby Spanish Oaks, & Sagebrush Trail). The home above is fairly typical for the Friendswood neighborhood, in size and structure; however, unique is the ORANGE color that not even our Nikon could capture accurately! Underwood Drive, with its 22 homes, is only one of eight streets in Greensboro starting with the letter U. We're getting to the end of the alphabet for ABC Wednesday. Check out A-U here. V-Z are still up for grabs if you have an idea or request! We think these are Red Hat Ladies posing with Accordionist Bill Schwartz at the Parisian Promenade. According to their website, the Red Hat Society is "a global society of women that supports and encourages women in their pursuit of fun, friendship, freedom, fulfillment, and fitness." Well, their mission about sums up the good time that was had at Sunday's Parisian Promenade. The Parisian Promenade in Bicentennial Gardens is a little like the Easter Parade in NYC. Part of the entertainment hinges on the promenaders dressing up, bringing their parasols and their pooches. The accordionist, strolled tirelessly, serenading the promenaders. Accordions are popular in European folk music, especially the Lawrence-Welk-style polkas. In the USA, they are gaining in popularity, especially with the rise in interest in Cajun music. Mr. Schwartz plays more in the soulful, French tradition. We are still smiling from the fun in the park at this free event. Let's hope the funding is available to sponsor it again next year. We're sharing this post with Ruby Tuesday where the color red is the catalyst for a virtual promenade! Yesterday, Lawn Chess was one of the many activities at Greensboro Beautiful's Parisian Promenade. People far and wide descended upon Tanger Family Bicentennial Garden to enjoy the artwork, music, food, socializing and much more in these public gardens. Poodles, from teacup to giant standard to labradoodles; from privately acquired to rescued, brought their owners out for a stroll. Non-poodles were also welcome! As open, green space becomes transformed into apartments complexes and shopping, public spaces, such as parks, gardens and greenways, are becoming increasingly important to communities. Greensboro is no exception and Greensboro Beautiful and the Parks and Recreation Department are working hard to provide a great quality of life for our families. In the photo above, the older guy on the right appeared to be providing his young chess partner with pointers about chess with the giant lawn pieces. At the Parisian Promenade, children of all ages enjoyed the afternoon. Stop back for a few more photos this week. Skenes Chapel Holiness Church, located at 350 Martin Luther King Drive, has a special history. According to a News & Record article, from December 2010, "(t)he church was built in 1907 and was one of the first in the nation to have an ordained female pastor, Bishop A. J. Lewis Richmond (established 1913)." According to the article, the church was purchased from the Quakers in 1958. While the building is still structurally sound, the last century has taken its toll on this majestic building. A poigniant story of Skenes Chapel begins in August, 2010, when Chad McMurray was violently murdered in Ft. Lauderdale, FL. Chad was raised in Greensboro and attended Skenes Chapel. He was passionate about helping his church raise the money for a new roof, paint, and other, much needed, repairs. Chad's friends have continued his fundraising effort. Leo Reitzel, owner of Reitzel Custom Builders, has generously agreed to take on the roofing job in memory of Chad, his high school classmate. Bank of America maintains the memorial fund for accepting donations. Chad's mother, June McMurray, plans to establish a chapter of Parents of Murdered Children at Skenes Chapel. While the church doesn't appear to have a website, you can listen to the choir sing, The Lord is my Light, here, on YouTube. This is our second hydrangea photo in a week but we just can't resist sharing this little ladybug who was visiting us on the hydrangeas that refuse to open all the way. This is the time of year when something beautiful in nature presents itself with each new glance. Carrying your camera out to the garden pays off. Ladybugs are actually in the beetle family. With over 5,000 species, these coccinellids are found worldwide. Four hundred and fifty species are native to North America alone. If you check the previous link, you will learn that the name actually comes from Mary, Jesus' mother, as the (European) ladybug-- featured above-- has a red cloak with seven spots, representing Mary's seven joys and seven sorrows. In the winter, ladybugs like to invade homes. Speaking of invading, Asian ladybugs are invading the USA and are causing concern with gardeners in the NC mountains (read here); however, so far in Greensboro, we seem relatively spared the recently imported ladybug. If you have ladybugs in your garden, they are helpful in reducing the aphid population. You can even purchase ladybugs for that purpose. Are you a ladybug lover? If so, head over to the Parisian Promenade at Tanger Bicentennial Garden from 1-5 and you'll be sure to see some nature, both real and recreated! This piano in the sky is very visible from I-40 near the Farmers Market on Sandy Ridge Road. Piano and Organ Distributors has it suspended, leaving no doubt that you have found their store-- if you are looking it. Perhaps they even entice some impulse buyers with this great display. We'd seen the scene for years and decided to explore it a little closer one day. This part of Greensboro is great for finding not only pianos and organs but also campers. Click here to see what kind of music we are imagining this piano playing today. Visit Skywatch Friday to enjoy other sky photos from around the world. Today, we head a few blocks north from yesterday's photo to the corner of Tate sand West Market Street. This hydrangea is as beautiful as specimens grown by members of the National Hydrangea Society. This blue mophead is taller than the porch rail and the scene looks like grandmother's porch down a quiet rural road. In actuality, the intersection is very busy. The wrap-around porch is part of a house known as the Kennedy Chase House. Two lawyers, Chut & Brackett, and Swaim Tax Accounting have their offices here. Formerly it was the law office Mike Barber who was also a city councilman. We drive past this thriving-- yet, likely neglected-- hydrangea and wonder why ours in the back yard has half-opened blooms and wilts at the drop of a hat. It seems like the most neglected hydrangeas are the hardiest. We do know that the blue ones have more aluminum in the soil that the pink ones. If it stays this hot in Greensboro (96 degrees yesterday), we might have to go calling on this business with iced-tea in arm so that we can rest a spell and enjoy the beauty of these flowers. How is your luck with hydrangeas? We're headed to this website to learn a little more about them. Today is ABC Wednesday and "T" is for Tate Street. Tate Street is located on the eastern edge of the University of North Carolina at Greensboro and just west of Greensboro College. It has never gained the notoriety of Chapel Hill's Franklin Street as UNCG and Greensboro College, combined, don't approach the student population at Chapel Hill (approx. 17,000; 1,200; and 29,000 respectively). However, owners of businesses like Tate Street Coffee and Sisters Jewelry have worked tirelessly to bring special music events, art exhibits, and street festivals-- good, clean family fun-- to Tate Street. Weatherspoon Gallery and Aycock Auditorium also attract people from all walks of life to the area. Tate Street is located in College Hill, a revitalized neighborhood that became an historic district in 1980. According to the city's website, the city and the College Hill residents have collaborated to refurbish and revitalize its streets (reference here). If you are interested in learning more about the College Hill Plan, read here. We selected 309 Tate for our "T" entry today because, Greensboro Daily Photo is a member of the city daily photo community and we like to participate in the first-of-the-month theme day. For June, the theme is "under construction." 309 Tate, like College Hill, is under (re)construction. As can be seen by the ladder, the new porch ceiling boards and the paint-in-process, 309 Tate is undergoing a facelift. Speaking of "under construction" one has only to drive by South Mendenhall and Spring Garden and you will see a giant student housing compound under construction in College Hill. We only hope there will always be room for single family dwellings in this neighborhood. Click here to view thumbnails for all participants of CDP's "Under Construction" theme day! Congressman Howard Coble spoke at Sunday's Memorial Day event at Forest Lawn Cemetery. He was one of many retired military personnel who participated in the event. His own military service includes five years of active duty in the U.S. Coast Guard and eighteen years of additional duty in the reserves. This action shot shows the congressman immediately after he finished his speech, at about 1:10, racing to his car to make a 2:00 speaking engagement in Asheboro. Congressman Coble works hard to maintain visibility throughout the entire sixth district. Having served since 1985, he is the longest-serving Republican congressman in North Carolina. This distinction indicates he is making his constituents happy. Age does not seem to get in Congressman Coble's way; at eighty, he beelined to his car without assistance. We hope he made his speaking engagement on time. On a personal note, he has pledged not to take a pension when/if he retires! Have a happy last day of the month to you AND to Congressman Coble. American Legion Auxiliary Unit 53 organized the The 2011 Memorial Day Program, held yesterday in the Veterans Plot of the Forest Lawn Cemetery. The guest speaker was the Honorable J. Howard Coble. The program included the presentation of floral tributes, singing, a reading of the roll of honor, and benediction. One of the most touching moments of the program, however, was when those who previously served bowed their heads in reflection as the Southeast High School JNROTC saluted those who gave their lives in service to country by firing rifles and and playing Taps. Upon leaving the cemetery, we noticed a man in his lawn chair beside the grave of a loved one. Before the big movement of designing urban parks, at the end of the 19th and beginning of the 20th century by Downing, Olmstead, and the likes (here), cemeteries played more of a role in our leisure time outdoors. It was commonplace to spend an afternoon, or to have a picnic, in a cemetery. Today, cemetery visits are largely limited to military holidays and funerals. If you want to teach a young child about the meaning of Memorial Day, it is not too late to visit the Veteran's Section of Forest Lawn Cemetery. It is ablaze with American flags and red, white, & blue bouquets. Potter's House Ministries is located at 311 Creek Ridge Road, on the corner of Randleman Road, a stone's throw from Stephanie's. We arrived, just as Potter's House was finishing with their Sunday service a couple of weeks ago. Potter's House was founded by Bishop Manwell Grady and his wife, Linda. While Bishop Grady has served in pastoral ministry for over 16 years, it is not entirely clear from their website, how long Potter's House has been open. They are a Trinity based church with no apparent affiliation with a specific denomination. When, on one of their web pages, they talk about " a sacred episcopal service of consecration installation," likely, "episcopal" is referring to the bishop/overseer of the church and does not imply denomination. Bishop Grady was installed on April 2006, a little over five years ago. Perhaps that's when the church began. If you are interested, services begin promptly at 11:00 am on Sundays and, at least the Sunday we were in the neighborhood, are still in session at 1:00. The Gradys are very involved not only with Potter's House but also with Christian broadcasting in the Greensboro community. As lovers of history, we wish their website had a more about the history of the actual building that houses the services as well as how the church came in to being and the history of what they have accomplished to date. In their defense, we're sure Bishop and Pastor Grady would be happy to tell us if we called on them personally, or even better, if we attended a service! Happy Sacred Sunday to all of you. We're off to find some patriotic, Memorial Day events. Memorial Day Weekend is upon us and Greensboro is about as crowded as the front window of ELSEWHERE. Many people have gone to the beach or to the mountains. For sure, lots of our residents are are ELSEWHERE. North Carolina is lucky to have landforms ranging from the beach to the mountains and this weekend represents the kick-off for summer. Students are in school for a couple of more weeks; however, mentally, summer begins for us with this holiday. People who do stay in town, likely, will head to their community pool. ELSEWHERE, photographed above, is "a living museum designing collaborative futures from old things." Basically, it is the remnants of a thrift shop where nothing has been for sale since proprietor Sylvia Gray died. Her grandson has transformed the space into a living, working museum in the 600 block of South Elm Street, across from the Mellow Mushroom. We love the dynamic nature of the storefront that changes almost weekly. If you read this before 2pm, you might want to stop by their Saturday creative workshop for children of all ages. We're sharing this with our friends at Weekend Reflections where all the photos have some sort of reflection. Greensboro is a big golfing town and here you can see we've "gone golfing." Actually, this is the driving range at Bur-Mil park. It is open to the public and mighty fun and affordable. These men were having a blast while their children practiced at the putting green and, in at least one case, the wife was looking on. In the 1930's Greensboro launched its first PGA-sanctioned tournament and golf has become entrenched in our local culture. Public and private courses abound in our city. The News & Record has assembled a great history of golf in Greensboro (here). This is our contribution to Skywatch Friday-- a place to enjoy the sky fifty-two weeks a year. This tobacco barn, located in Guilford County, is about the polar opposite of yesterday's Summit Avenue mansion. However, don't be fooled, this humble structure has a big role in North Carolina's history. Tobacco was first introduced to North Carolina when the early settlers from Virginia were looking for a crop that would grow in the poor soil of the sandhills and would be marketable in Europe. North Carolina ranks first in the US with respect to tobacco production and every step of the process from leaves in fields to the finished pack can be found in our state. The 2006, annual farm income for tobacco was $506.2 million (reference). UNC--TV has a fabulous timeline on the history of tobacco in North Carolina (here). Today's photo represents the farming end of the cigarette industry. Historically, tobacco farming was a whole-community effort. When the tobacco was ready, it was not uncommon for children to unload the sleds of tobacco pulled in by the mules & tractors. Men, including young adults, primed the tobacco and hung it in the barns. Often it was the women who tied tobacco to sticks. Basically, everyone chipped in to get the tobacco ready. North Carolina has a love-hate relationship with the product. As much as tobacco contributes to our place in the global economy, we know how bad it is for one's health and can only hope that our friends and loved ones don't partake. Previously, we featured the farm end here and the manufacturing end here. Today is "S" day on ABC Wednesday and we've hit the "S" lottery with the symmetrical, Sigmund Sternberger house on Summit Avenue! Sigmund Sternberger moved to Greensboro from South Carolina in 1899 when he was twelve years old. In 1926 (at the age of 39), Mr. Sternberger built the above house at 712 Summit Avenue. This green-tiled, Mediterranean-styled brick house was considered a masterpiece of construction in its day. Mr. Sternberger lived there with his sister, Rosa, and her husband, R. Mack Williams. Mrs. (Sternberger) Williams managed the home and oversaw the care of the home inside and out, including the formal and informal gardens. Still standing today, behind the house, is a brick carriage house and another small outbuilding that looks like it might have originally been a kitchen. Today, other than this landscaping visible in the front, not much remains of the original gardens. The interior woodwork is intact. Unfortunately, the furnishings do not do the house justice. The Aycock/Summit Avenue residential neighborhood was founded in 1895 and developed by the Sternbergers, along with their textile-mill, business partners the Cones. The neighborhood was conveniently located between downtown Greensboro, the textile mills, and the thriving mill communities built for employees. Mr. Sternberger lived at 712 Summit Avenue until his death in 1964. The family did not want the house to be torn down to become office buildings or retail space, like the properties around it. To ensure that the home be preserved, it was a memorial gift to the United Arts Council of Greensboro by the Sigmund Sternberg Foundation in 1971. The home was placed on the national register of historic places in 1993. Today, it is studio and teaching space for local artists. The Sternberger home is well-documented (read here). If you are interested in history and biographies of Greensboro, Sigmund Sternberger was an amazing citizen whose philanthropic legacy and financial commitment to the arts continues today into the 21st century (here). School students in Greensboro would be well-served to learn about the life of Sigmund Sternberger. Even though his father and uncle (Herman and Emanuel Sternberger) founded Revolution Cotton Mill Corporation, young Sigmund worked his way up from errand boy through just about every job to treasurer and eventually to director. No job was too menial for the young Sternberger! Also, his commitment to civic, charitable, and religious organizations was impressive. As an example, he served at treasure for Temple Emanuel for 47 years. To see our A-R selections, go here. Also note that the house above is only about a block from the Bessemer Curb Market.